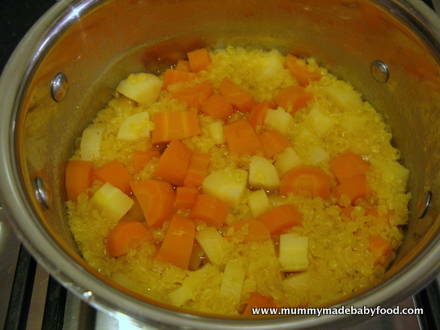 This lovely vegetarian baby recipe is a perfect first protein meal - full of red lentil goodness and tasty root vegetables. Apart from being an excellent and inexpensive source of protein, red lentils are easy to cook and have a wonderfully warming flavour for filling little tummies. If you have weaned your baby on single and combination fruits and vegetables, he should be happy to accept this dish. A nice way to introduce new flavours is to pair them with root vegetables, as babies tend to be more accepting of the natural sweetness of the vegetables, which can also serve to offset any strong new flavour. Red lentils stand out amongst pulses, as they do not require any pre-soaking before cooking - great for those who don't plan ahead! They are surprisingly dusty, however, so rinse them well - until the water runs clear - before cooking. The slow-digesting carbohydrates and dietary fibre found in red lentils help keep you feeling full for hours after your meal, and they have a lovely creamy texture when cooked, so nice and easy for babies to digest. When raising a vegetarian baby, it is important to ensure he receives enough protein in his diet, important for physical growth and development. In the absence of red meat, iron deficiency can become a risk, so include lots of iron-rich leafy green vegetables in your baby's diet. Lentils, and other pulses, are fantastic sources of plant-based protein and iron and are therefore ideal for forming the cornerstone of any vegetarian diet. 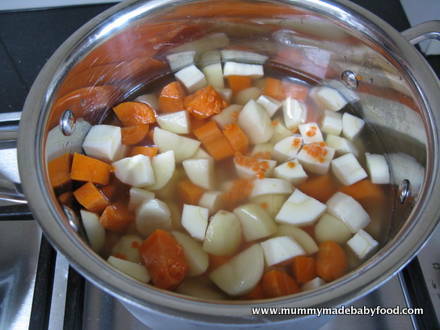 This recipe yields approximately 7 servings for older babies eating full-portion meals but can be easily divided into several smaller 15ml 'cubes' for babies not yet accustomed to eating full-size meals. Put the vegetables, lentils and stock together in a medium saucepan. Place the pan on high heat and bring to the boil. Then cover, lower heat, and simmer gently for 40 minutes until the lentils are soft and most of the liquid has been absorbed. 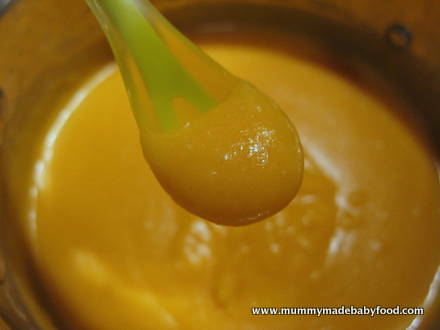 Using a conventional blender (allow to cool slightly) or a handheld stick blender, puree the mixture until smooth. Cool sufficiently before serving to baby, freezing any extra for future use.